Carol, congrats on your fifth anniversary as a blogger! Your long and persistent struggle to discourage the use of American Indians as names and mascots is admirable and courageous. Changing entrenched behavior does not come easy. This is a great piece (again) I did not realise your Wisconsin roots. My very first pen friend lived in Wisconsin, (is there a town called Antigo? It`s 55 years ago and my memory is not so good.) Her name was Luann Zangle and I have often wondered what she did in her life. Your piece reminds me quite a bit of me and some of the battles for justice and respect, inclusion and equality I have fought on behalf of others, you don’t give up and you don`t allow ignorance to intimidate you. Thank you so much for your thoughtful comments, Nelly! I am so glad this post helped you remember your social justice advocacy! How interesting that you had a pen pal in Antigo, Wisconsin! I have driven through there many times, and even stayed over there when the winter roads were too dangerous. It’s in the rural northeastern part of the state (https://en.wikipedia.org/wiki/Antigo,_Wisconsin), just north of the Menominee reservation and to the west of the Mole Lake Ojibwe reservation and the Forest County Potawatomi reservation. Carol, as I am sure you are more aware than I, a system of government, such as this one, is never going to be changed for the better of the people/individuals involved. This statist system is, and has always been, operating just as it was intended to operate from its very beginnings. Any political activity meant to change, or ‘fix’, this statist system for the better, is simply a waste of time and energy, and history is my witness. A despotic, genocidal system of government, such as this one, can only be torn down, piece by piece, and never be allowed to rise again. Aldous Huxley once stated that, if there be a hell. this planet must be another planet’s hell (my paraphrase). Capitalism is a curse! But having stated all of this, I know nothing will ever change for the better of humanity, since humanity seems very content to be ruled over and enslaved, over and over again, by a tiny minority of inbred psychopaths. You know this much better than I, Carol, as your post, here, reveals! It was my paternal ancestors who helped create this hell on earth. And this, along with many other reasons, is why I despise this government and its obedient and faithful herd of cattle, whether on the left, middle or right. Sorry, didn’t mean to go on this long! It isn’t pleasant to admit, or say, but I concur with Sojourner with my studies of history, the years and experience to back it up. We struggle to establish a bit of temporary political correctness but we are not touching what really matters and that is the sad part. There must come a complete end of this civilization and if it’s in the cards; if the right kind of people survive the collapse, the rise of a new “thing” which may not even be a civilization but something much superior: the rise of the self-empowered, independent thinking, compassionate, empathic true human. Are we going to decide this, or are we going to allow the mindless future to dictate what becomes of us and our world? I could not agree more, Sha ‘Tara! Let us set our hopes, sights and energy on this kind of world,. for all future generations, a life worth living! The student in my class who just wrote a powerful reflection essay about Edward Bernays after watching “The Century of the Self” video makes me realize what I do matters for one person at a time. The logo battle gave others the courage to fight to protect their children and work to raise awareness in their communities. If we all remain silent and helpless we are all doomed. I know you know this, too, dear friend, because you still keep trying to raise awareness and create new beauty with your music. Excellent blog post. I remember my own passages through similar “unpopular” attacks on the status quo, the times when a death threat became a shot in the arm, with the thought, ‘yeah, they’re scared their privileged position may be successfully challenged and they be forced to make changes within the way the view and interact with society.’ Who the “they” were varied depending on the issues, whether is was farmland protection, protests against environmental degradation of lands, streams and air due to unregulated commercial and industrial expansion or CIA destabilizations and genocides of indigenous peoples in Central America, particularly during the Reagan contras years. The conservative rednecks came from all walks of life. I look back and I wonder, since all was eventually lost, would it have been better to just let it go and watch the chaos and inevitable downfall move in quicker with perhaps less sorrow and death? Today, in retrospect, I wonder if our struggles amounted to a hill of beans, or if we were misguided in our efforts? I know I would not do it the same way again – I never return to methods that have failed. As was written ages ago, ‘the heart of man is deceitful above all things and beyond cure.’ So I have observed. We can change surface things like sports team logos but is the heart, the essential mind, actually changed in the process? These are my questions as an ‘elder’ in my own right. How do you change the heart/mind, Carol? Thank you for sharing crucial insights based on experience, Sha’Tara. In this case, I don’t see the outcome as “failure.” Although it took ten years, the name and logo were eventually retired because students in the community led change efforts. I have often wondered if the leaders of the change initiative came from the 4th and 5th graders I spoke with a decade earlier. The state also gained the use of another tool to address discrimination in public education, and many Native people used it successfully. Ultimately, even state legislation followed. Could not agree more, Andrea! I wish I had accomplished as much for others as you have, Carol! Oh for seven billion more like you! Thanks so much for sharing this, Carol… Your courage is more than commendable and hopefully, things are changing. Battles abound around the country (including my own state of Maine). The media remains on top of this issue and people of all generations are beginning to listen. of others to touch their empathy! Happy 5th anniversary to your blog. You chose an exceptional piece to commemorate the anniversary. It seems that the struggles never end. And sometimes we all feel that we haven’t done enough. But we do what we can, when we can for those things that matter. Pax. Carol, what a great bit of history! And you didn’t even burn down the school ……. nice going. Congrats on your blog’s anniversary. Thanks for being strong and committed. Wow! I had not seen this post but it must be one of the most powerful and heartfelt of any first ones. Your courage and conviction is commendable and I am in awe of you, that you pressed ahead with so many against you. I am shocked by the anger and vitriol you came up against and what shines through is the help of the few brave ones. 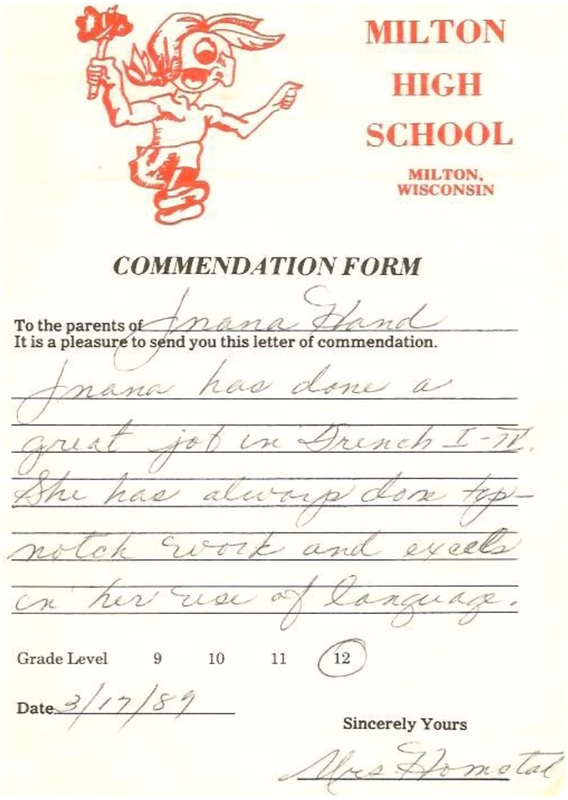 You made a huge difference … and it all started with your daughter’s note of commendation. Never think you should have done more, please. Be proud of your achievement and the ongoing change. This had a huge impact and still does. It must have been heartening to talk to the students themselves early on and hear their reasoned comments … so much more receptive than the angry crowd at the school. But for people like you the bigotry and discrimination would continue. Dear Annika, thank you so much for your thoughtful, lovely comments. Your kind, supportive words touched me deeply when I read them and still do now and I apologize for not thanking you sooner. Winter weather and teaching responsibilities have made it really difficult for me to keep up with blogging this semester. Spring break and flooding have given me time to try to catch up. I admit I scanned past the image, initially as I was reading the text. Then I looked back and thought – WOW. I think it’s amazing what you did. You and many others make such a large difference, something that not many people would have even been able to accomplish. Keeping a calm head in those positions is amazing. Bravo, Carol! It is not easy to fight “city hall” (my mom always said that 😉)…or school boards…or an angry mob set upon attacking you!! It is not easy to get people to see that change is necessary and then be able to actually see the changes. This is a very inspiring post which speaks to compassion, justice, respect and courage. Beautifully done. You are a courageous woman, Carol. You are an example of both standing up for what is honorable and working behind the scenes as you teach the next generation of leaders. Too many begin to stand up only to be encouraged with fear tactics to back off. You stood when others would have turned away. I bow to you and the courage, wisdom, perspective…and leadership that you so clearly showed everyone in your actions (and still do). Happy blogging anniversary! Nómads from anabel amiens on Vimeo. Sarah, thank you so much for your thoughtful comments and for sharing such important observations about continuing anti-Native discrimination. I appreciate knowing more about how many places we have in common!